Everything related to cancer and finding new drugs to cure it is a very interesting subject for many people. If you add a touch of big pharmaceutical companies conspiracy, the result is headlines like "Researchers find the cure for cancer but is not profitable for the pharmaceutical companies and it may never come to light". These last days several friends, readers of my blog and some twitter users have contacted me to ask about some news about a "wonder drug" that can cure cancer. These articles were talking about the fact that this drug has been in the market for a long time and it's not covered by a patent. Therefore, the big pharmaceutical companies are not interested in funding the research with this drug (that is going to cure cancer) because is not profitable for them. The so called "wonder drug" that "cures cancer" is called dichloroacetate (DCA). The DCA is a small molecule very similar to the acetic acid, but with two hydrogens substituted by two chloros. Interestingly, if we add one more chloro it turns into TCA, a compound that we use in the lab to make DNA and proteins insoluble. The DCA is not a new drug. It has been in the market for several years and it has been used in diseases related to the mitochondrial metabolism. Mitochondrias are the cell parts that produce the energy to keep the cell alive and have been called "power plants" or "batteries" of the cell as well. The energy in the mitochondria is produced through a process called "Krebs cycle" that requires oxygen to work properly. However, cancer cells use another process that is simpler, doesn't require oxygen and occurs outside the mitochondria. Mitochondria is a key part of the cell: it does produce energy and if something goes wrong in it, it can trigger cellular death, helping the no formation of cancer cells. Due to the fact that the cancer cells "switch off" their mitochondrias (they don't use them to produce energy), scientists think that this can be an escaping mechanism of cellular death and therefore these cells become immortal. So, the DCA mechanism of action is to block the alternative process of getting energy, forcing cancer cells to produce energy again through the Krebs cycle in the mitochondrias. All the news that have appeared in the mass media about this issue are related to a paper published by Dr. Michelakis and colleagues at University of Alberta (Canada) in 2010. These researchers already published another paper in 2007 where they showed the results of a study using this drug in different cellular cultures and rodents. Actually, DCA was able to slow the growth and reduce the size of tumours in rats. However, it wasn't able to eradicate the tumours completely or prevent tumour growth. After getting these results, Dr. Michelakis received the permission to start a clinical trial with fifty patients who had a specific brain tumour called glioblastoma. In the 2010 paper the scientists show the result of the phase I clinical trial in five patients. For all of you who are not familiar with the different kind of clinical trials (there are phase I, II, III and IV trials), phase I trials study the right dose that doesn't cause toxicity, not the efficacy itself. Because DCA has been used before to treat other diseases it's known that it can be used in humans in a safe way (despite producing some side effects in the nervous system), but this is the first time that is used in cancer patients. 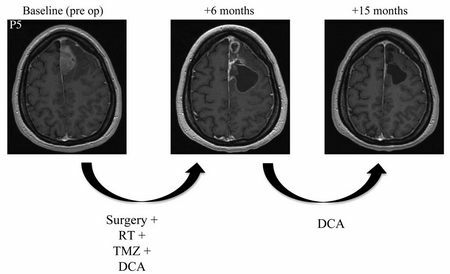 Therefore, five patients with advanced glioblastoma received DCA in combination with radiotherapy, another drug called temozolomyde and surgery. Four patients were still alive after eighteen months and three of them showed a reduction in tumour size. However, it's difficult to know if this result is statistically significant due to the small size of the study (only five patients when phase I trials usually have ten to twenty patients). In addition, the combination of drugs and treatments that the patients received doesn't allow us to know if the effect is due to the DCA. An interesting fact is that the scientists took samples of the tumour before and after the treatment and saw that DCA was helping to "switch back on" the mitochondrias. The main problem of this study is that the mechanism of action of DCA is not clear. Cancers are composed usually by two kind of cells: cancer stem cells, that divide a lot and are resistant to conventional chemotherapy, and the "regular" cancer cells that are eliminated with chemotherapy. Actually, another paper has been recently published (May 2011) with the results of a study where DCA was used in cellular cultures of a different kind of cancer, the neuroblastoma. This cancer shouldn't be affected by DCA because of the characteristics of its mitochondrias, however, it is affected. DCA affects neuroblastoma cells in a similar way to the one described by Dr. Michelakis, but only the cancer stem cells of the tumour, not the regular ones. This study shows again that DCA cannot eradicate the tumours completely. As you can see, things are not as simple as they are presented in some mass media. Actually, cancers in general are quite complicated and to find the right treatment for each one many factors have to be taken into account. For instance, cancer cells are not isolated. They are surrounded by other cells and interact with them. Related to this issue, last year another paper was published with a study in breast cancer cells of some processes related to mitochondrias. This paper is interesting because they show that the fact that the cancer cells "switch off" their mitochondrias and use the alternative process to produce energy is not completely true. These researchers put breast cancer cells (with "switched off" mitochondrias) and cells that are usually around the cancer cells (with normal "switched on" mitochondrias) together in a culture. The result was very interesting: at the end of the experiment the cancer cells had their mitochondrias switched back on. There are still many things to study related to the use of DCA as a drug in cancer treatment and we can't say that it's going to improve the treatment of some cancers yet. So, I have an advise for you. If you read in a newspaper or internet, or hear in the radio or TV that "the cure for cancer" has been found, be cautious and don't believe it straight away. There is still a long way to go and it's not easy.